This Danish city uses innovative methods to control the flow of storm water. As sea levels rise and coastal areas experience more frequent superstorms, cities by the sea must learn to cope with excess water. Copenhagen, Denmark is taking a long-term approach to these rising issues. This forward thinking comes from the city’s climate unit, headed by Lykke Leonardson. But to address the flooding that’s happening now, city officials are creating pocket parks – used for recreation most of the time – and for holding water when it rains. These water-holding areas will be linked – like pearls on a string – by convex streets that are specially designed to direct excess water from park to park, controlling the water and ultimately delivering it to the harbor. The idea is to slow the flow of water through the city and keep it out of the storm drains to prevent sewage overflow. City leaders are urging residents to help by replacing concrete or tile in their backyards with grass or trees. They expect these strategies will better prepare the city for the changing climate ahead. 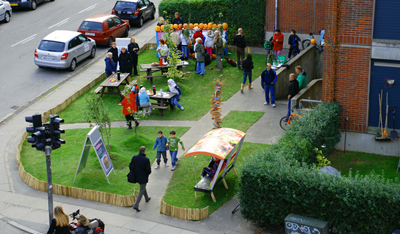 Photo: Pocket park in Copenhagen (credit: Arne Hansen/The Municiplaity of Copenhagen) (source: Danish Architecture Centre).